Even now, tears well in Dr. Dana Bush’s eyes when she recalls the moment that she led 26 EKU students into the room housing Michelangelo’s iconic 17-foot-tall statue of biblical hero David. Such is the life-changing impact of an annual tour of Italy organized by the EKU Department of Family and Consumer Sciences, which Bush, ’95, chairs. For the first time this year, nine Eastern alumni joined the students and faculty for a portion of the tour, which encompassed Florence, Siena, nearby wine country and Rome, and carried the name of the credit class from which it sprung, Food, Fashion and Family. For most of the students, it was their first time to fly, let alone visit another country. But they soon came to think of Florence, their base, as sort of a second home, even making friends with the shopkeepers who forgave their butchered attempts at the Italian language. While in Italy, the students took language/culture and cooking classes; visited museums, churches and historic sites; toured a Gucci factory; watched artisans at work; enjoyed a runway fashion show; and spent a “very cold” January morning beautifying a Florence park, repaying a debt of gratitude to the city that so warmly welcomed them. But it wasn’t necessarily the organized activities that left the most vivid impressions. Brashear was surprised to see the streets still filled with Christmas decorations through Jan. 6, Epiphany on the Catholic church calendar. The occasion was marked by a “huge parade that people from all over the world come to watch,” and the students also learned about Befana, an Italian equivalent of Santa Claus. Whether it was learning to enjoy foods they never would have tried back home, tearing up at the beauty of a Gregorian chant sung by monks in a 14th-century chapel, or appreciating the beauty and serenity of the famous Boboli Gardens in Florence, the students were changed in immeasurable ways. Bush also enjoyed seeing the students and alumni bond over the two weeks they were together. It was impossible to tell who gained more, or who learned more from whom. Donna Caldwell, ’92 ’95, said she “really enjoyed the opportunity to be with and get to know the EKU students. It was so encouraging to ... talk with them about their goals for the future and to hear them reflecting on all they were learning, and how the knowledge they gained was so much more than they could have imagined. The same goes for Renee Kaspner, ’87, who came all the way from California to join the journey. Kaspner has already made a trip back to campus to see her newfound friends. Not surprisingly, interest in the Italy tour has grown rapidly from just four students who joined the first trip two years ago. But the experience never gets old, either for the students who return or for the faculty. 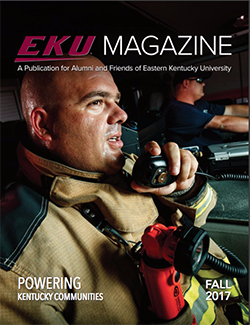 -- This article also appears in the Fall 2017 EKU Magazine.